Yesterday was my girls’ first day of summer camp. I was so busy packing their food and explaining to them that they can only eat what I am making that I totally forgot to pack anything for my husband’s day-long business trip. After he left, I surveyed the kitchen and noticed that all of the granola bars were gone as well as the bananas and some leftover popcorn. So while that is probably not an ideal days worth of food he at least took care of it himself before he rushed out the door. I also didn’t eat as heartily as I normally would have liked yesterday with my kids gone at camp so needless to say we were both ready to chow down last night. So I decided to make some pizza for dinner, and boy did it hit the spot. 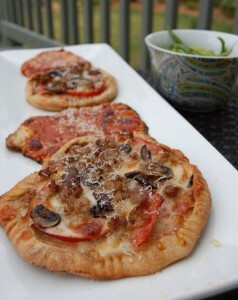 It was actually my 5-year-old’s idea to make little “individual” pizzas, and I have to admit it was a pretty good idea. I gave each of them their own dough and let them go to town. They absolutely loved making it and especially enjoyed putting on their own sauce and cheese. Instead of using sauce on the adult pizza I sliced some homegrown tomatoes, which turned out to be delicious baked under a pile of cheese, sautéed local sausage, and organic mushrooms. We also had some steamed green beans. Aside from the burnt roof of my mouth from digging in too fast, it turned out to be a fabulous, hearty meal that was enjoyed by all. Back to the first day of camp…I was told to pack my kids’ lunches and that the teachers would provide a snack. When I dropped them off I explained that my girls were on a “special diet” and could only eat what I was providing (which included their own snack). I was thankful that my 5-year-old seems to get what we are doing by now, and I felt like I could somewhat count on her to make sure nothing went wrong. When it was time for me to pick them up a teacher said that at the last minute one of the other teachers saved the day! Unsure what she meant she went on to explain that at the end of the day they gave each kid a sucker. With everything they had going on they momentarily forgot my kids should not get one and passed them out anyway. The teacher that saved the day suddenly remembered and swooped the suckers back up (from my 2 kids only) and instead gave them “special” star stickers. I was SHOCKED and relieved to learn that there were no tantrums over the removed sucker. I will definitely be giving the teachers an alternate “approved” treat to hand out at sucker time for the rest of the week. I also later learned that my 5-year-old was offered Nilla Wafers and she told me that she said “no I can’t have any because we are doing the 100 Days of Real Food.” That’s my girl. Speaking of my girl we were waiting to get some water at a concession stand the other day. This kind of place is my worst nightmare right now with display cases full of candy bars and chips and serving hot items like chicken nuggets, fries, and hot dogs. I was hoping for a pleasant escape with our free cup of water, when I heard the dreaded “I am hungry for a snack”. Wow, I wonder where she got that idea? So of course I said “we can’t have any of this right now, and I promise I will give you something as soon as we get home.” A few moments later my 5-year-old proudly spotted a basket of bananas on the counter that I hadn’t even noticed. How could I have ever thought it was so bad to involve my children in this little project of ours when it has taught my daughter to find (and want) the one and only healthy whole food out of a sea of junk??? One thing I have learned is that after a few bumps in the road kids can be unbelievably adaptable. I’d be very interested to know how you are FEELING? After 30 days, have you noticed any noticable differences? And how’s the (gulp) weight? Good question! I will do a more in detail post on this soon…but for now some of the more pronounced changes we have noticed is that our youngest daughter’s constipation is completely cured and her wheezing (from a slight case of asthma) seems to be better although it may be too early to tell if the latter is related to diet. I have also noticed that I need much less sleep to feel rested and I am having less “afternoon” slumps” – which has been good for me! I will definitely write more on this in a future post. Hi Lisa! I discovered this blog yesterday and I wanted to let you know how inspiring you have been. I have recently started a similar challenge, and although I am vegan your journey has been much like mine. I even have bad dreams that I’m eating food I shouldn’t be eating! What I really wanted to tell you is that even though I have cut a lot of “bad” foods out of my diet, I have still been eating processed foods simply because there are not a lot of other options for me, especially when I eat out. I am so pleased that I found your blog because it has really shifted my way of thinking. I am a vegan primarily for health reasons, and I am learning more and more every single day. This journey is so hard, but SO worth it. So, thank you for everything you have taught me!! Welcome to the blog and thanks for the comment! The good thing is that whether you are a vegan, vegetarian, or just have some sort of food allergy I think people are much more understanding these days when someone is on a “special diet”. So don’t be afraid to just bring your own healthy homemade food the next time you are out with friends (they may even be envious of your dish!). Good luck with your journey! Will you please post your recipe for the pizza sauce? These look wonderful, but do you buy the sauce at whole foods or make it yourself? I’d love to have a good sauce recipe. 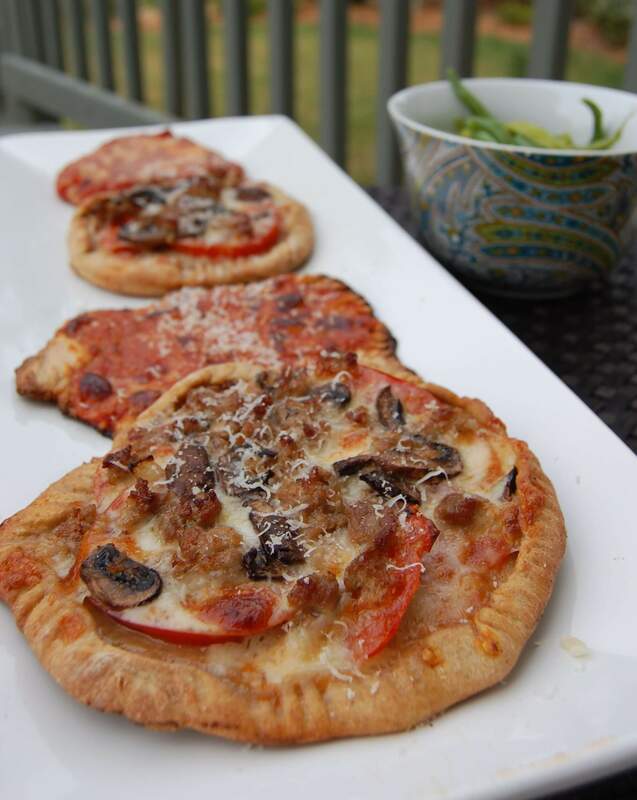 I’ve actually been buying a store-bought organic pizza sauce from Earth Fare (it comes in a jar) and we’ve really been enjoying it!